ar·ti·san –a person skilled in an applied art; a craftsperson. Textiles, design, fonts. These things give me pleasure every day. Which is great, because I am surrounded by them. My enjoyment is enhanced by exploring what has gone before; drawing threads of design out of the fabric of the past and re-stitching them in to the now. Many of us want ‘retro’ and ‘vintage’. The nostalgia of the old forms is appealing, as by definition they are established, and hence are still in sight despite the march of time. Their fore-gone flair can temper the wilder forays of our contemporary design landscape. They ‘work’ reassuringly as design, and can interrupt as a benchmark for style; grounding and inspiring us. 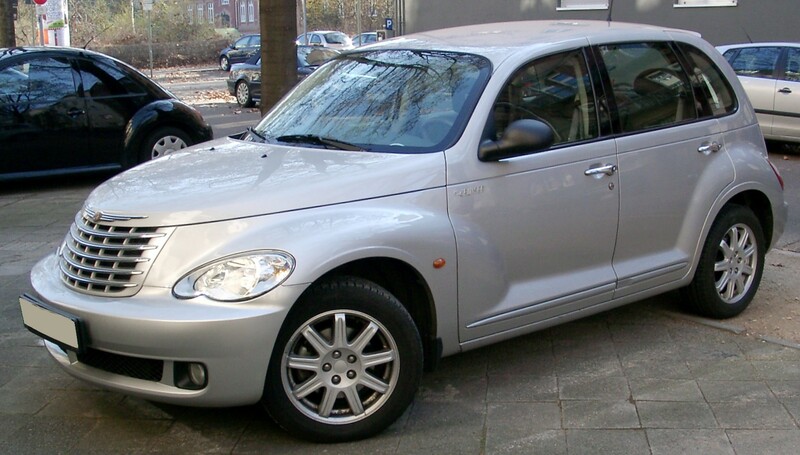 The excitement and interest over the introduction of the retro-styled PT Cruiser by Chrysler in 1999 was such because the pioneer designers had attempted to ignore almost a century of design evolution in cars, instead harking back to the original Model A Ford of 1902, and the hot rod gangster get-away cars of the 1930’s for the car’s aesthetic. The result was a ‘nowtro’ vehicle – a contemporary interpretation of a classic look. Although the PT Cruiser had a waiting list to start of with, demand quickly fell away – it failed on a few design/performance points but ultimately the design didn’t sell. 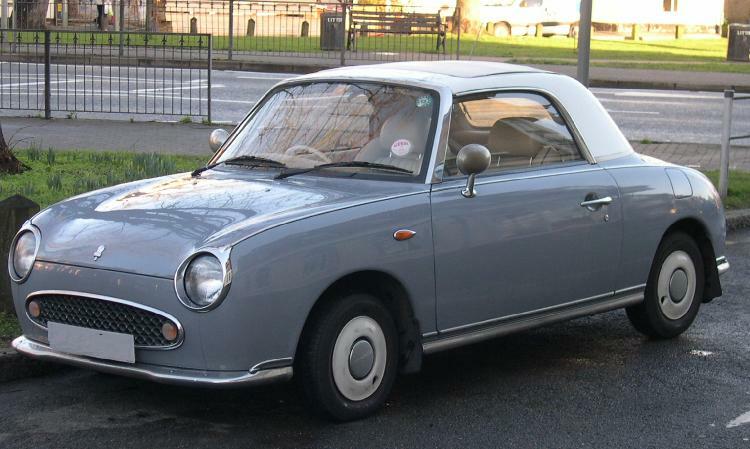 Arguably, the PT Cruiser started a trend for re-modelling classics or for casting new marques in an old fashioned mould – see the distinctively retro Nissan Figaro, below, for a popular example – plus of course the new mini’s. Anyhow, all of this is a preamble to the fact that this is another post about shopping. I am continuing my campaign to bring the joy back into kitting out; and to persuade everyone to seek the independent suppliers and service providers which give the best sourcing experiences there are. It’s also a celebration of the simple pleasures in life, a key one of which is working with artisans. 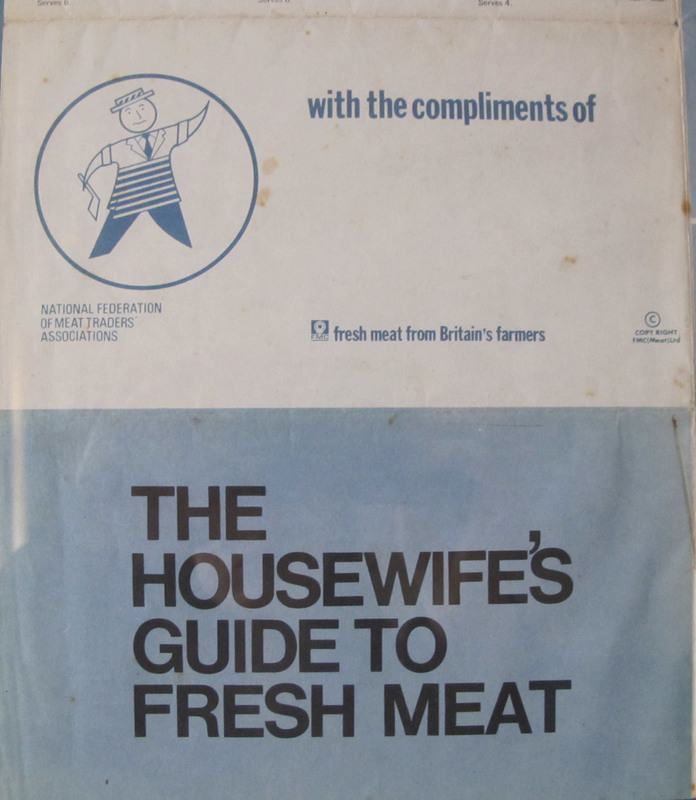 1960’s leaflet The Housewife’s Guide to Fresh Meat published by The National Meat Traders Association and copyright meat processors and slaughterers FMC (meat) Ltd. 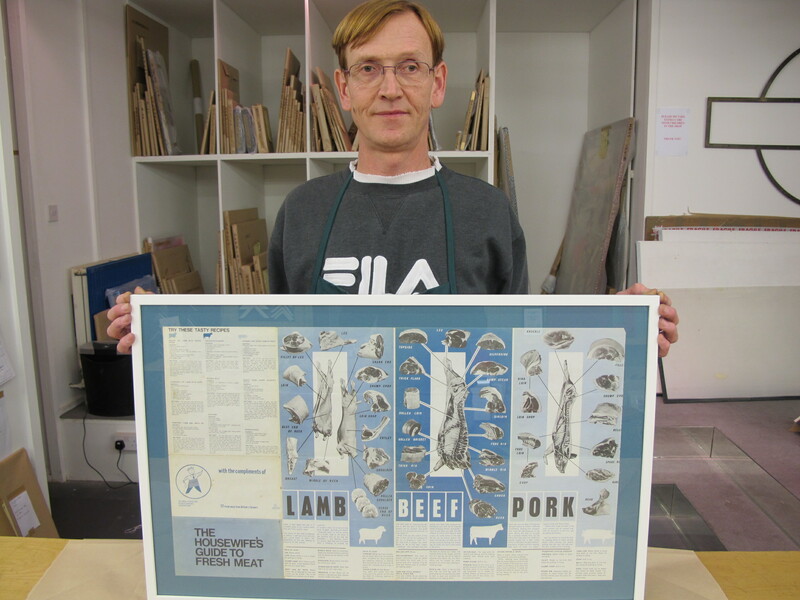 The leaflet folds out x4 into a 40 x 70cm poster, featuring lamb, beef and pork cuts, cooking guides and recipes. the leaflet was picked up by my grandmother Gally in the 1960’s and stuck on the wall of her kitchen as a practical guide to meat cuts, for buying purposes. She was adept at handling meat and knew all about marbling, feathering and fat when buying meat. Meat meant skinning, plucking, filleting, basting, broiling, boning, curing, jointing, mincing, pounding, roasting and seasoning. By the time she put it on the wall she was well in to her housewifely career and probably knew all the cuts off by heart, so I think mainly she appreciated it on a design level. She clearly liked having it there as it stayed for fifty years. I share in her appreciation of it. I decided to preserve it for its clear and useful graphics in practical and hygienic sanitary blues, the cultural value of its recipes, the domestic social history story it tells in the way it addresses ‘Housewives’ and the information they were deemed to require, and lastly but most importantly, it is part of the intergenerational connections in my family and honours the memory of a much loved and inspiring person. to preserve the poster in a way that would give it a fresh feel despite its aged appearance due to exposure to cooking greases, steam and light, and slight acid burn. To ‘contemporise’ it – initially I felt a bright blood red gloss frame would suit it. Paul Dufour, picture framer at the Frame Factory, Cross Street, Islington, London N1. Paul has been framing for ten years. His experience, a good eye, and plenty of unhurried time meant a very full consultation and plenty of excellent suggestions, plus the all important space for me to stand and stare at various combinations, head slightly cocked in complete silence for extended periods without feeling self conscious. This is vital when you are going for the artisan option because you are parting with money, and you only have one chance to get it right. We spent half an hour looking at mounting board samples in different colours, and widths and finishes of frames until deciding on the final combo. The poster is framed in 100% acid free sealed conditions, preserving it for the enjoyment for future generations, as long as it doesn’t have sunlight on it for sustained periods. We decided on the dark Mediterranean blue mounting card to tonally resonate with the three blue tones in the poster. On Paul’s advice I went with the half inch white plastic-coated wood frame as this presents as a gallery would, and allows the contents to attract the eye, which a blood red frame would not. The colour combination of white frame and dark Mediterranean blue was common in the 1960’s which strengthens the period feel, and showcases the print without distracting the eye. You would be amazed at how inexpensive this was, coming it at well below the buying of any ‘vintage’ original print, let alone framed. ← Risque merchandising trend continues! Your website is absolutely fascinating to me, and I will read it thoroughly in full shortly. I see exactly where you are coming from now regarding the artwork we framed for you. Thank you for your appreciation and recognition of what we do, and I look forward to assisting you with your next project.